2009. 320 pages. Mass market paperback. From: The public library – interlibrary loan. Jane Yellowrock is a Cherokee skinwalker, a human that can change into the form of an animal (usually that of a mountain lion). In this version of the world, vampires and witches are publicly known supernatural beings. As far as Jane knows, she is the only one of her kind, and so she protects her supernatural identity from all but her closest friends. Jane kills rogue vampires for a living. In Skinwalker, New Orleans’ vampire council hires her to kill a rogue vampire that has been gruesomely murdering humans and vampires alike. 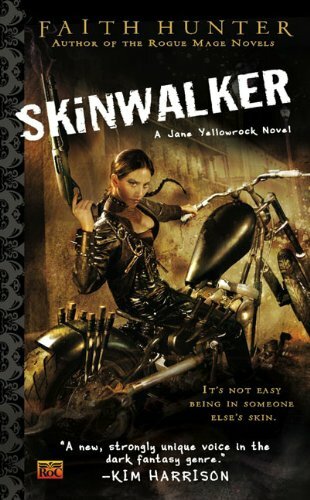 Jane Yellowrock is a great urban fantasy heroine. Though Jane’s Native American heritage and shapeshifting powers reminded me of Patricia Briggs’ character Mercy Thompson, the two characters have very different back-stories and inhabit different paranormal situations. Jane names this second consciousness ‘Beast’. When Jane shifts into the form of the lion, it is Beast’s thought-processes that are dominant. When Jane is in human form, Jane’s way of thinking is strongest. Neither is silenced when in the other’s form, and so there is this cool, frequently amusing, banter going on between the two of them. Sometimes, there is even a battle of the wills. I loved being inside of Jane’s mind because it was so interesting in there. While becoming accustomed to this unusual dual-narrator set-up, the reader learns – along with Jane – the intricate politics and rituals of the vampire clans in New Orleans. As befits a vampire-hunter, Jane is not generally fond of vampires, and is much more comfortable getting chummy with the vampires’ human servants. However, she does establish some uneasy working relationships with some of the vampires. The author is a native of Louisiana and this shines through in the familiar tone she takes in the book’s descriptions of New Orleans. There may have been a few too many scenes of Jane rambling around and discovering the city. However, since those scenes are responsible for me wanting to go there and eat lots of food, I guess you couldn’t call them entirely unsuccessful. This definitely seems to be a series worth following and I’ve already placed an inter-library loan request for the sequel, Blood Cross. So it’s almost the end of March and a quarter of the year gone. For (possibly only my own) amusement, I thought I’d see how I’m going on all those challenges I recklessly joined before the year began. So . . . heh heh heh. That looks a little sad. But it’s still March and I’m still optimistic and still interested in all the challenges, so it’s all good. A lot of the books that I have checked out from the library slot into at least one of those challenges. I’m working on it. The Spotlight Series is a reading and discussion series focused on small press publishers, their authors and their books. For this round, the spotlighted press is Unbridled Books. See other reviews for this series on the Spotlight Series website. After the dot com bubble burst, George Bailey (yes, he is named after the character in It’s a Wonderful Life) is financially ruined. 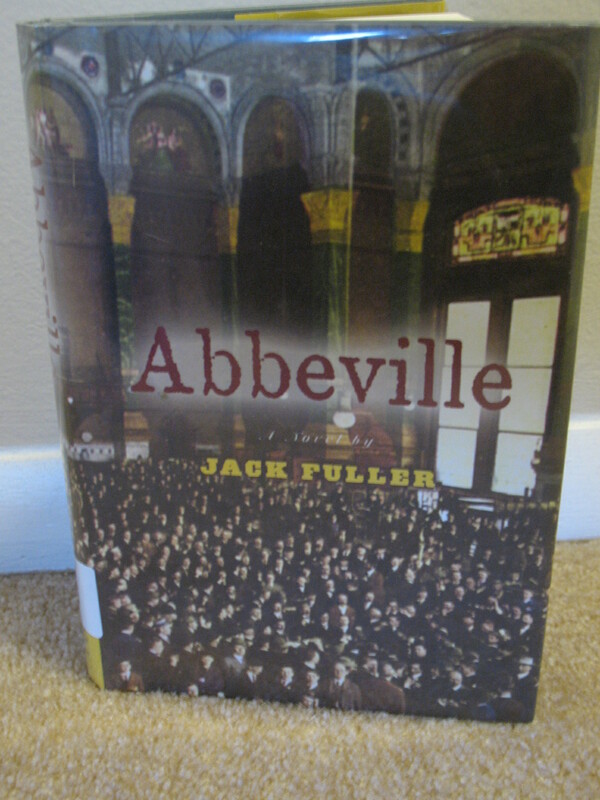 He returns to visit his small Midwest hometown – Abbeville – and there he considers his grandfather’s life. His grandfather had suffered great loss due to the 1929 stock market crash. The book tells the story of his grandfather, Karl Schumpeter, starting from his job as a clerk at his uncle’s logging camp in Wisconsin and spanning through the years and wars and family troubles until his death. The premise of this book was not my usual choice of story, sounding a little dull to my ears. However, I decided to take a chance on it, because sometimes judging by the story outline can lead to incorrect conclusions. Unfortunately, I had to conclude that I’m not the right audience for this book. I wouldn’t consider it a slog, because the prose is far too straight-forward to allow for anyone to get bogged down in it. There are some good descriptions of places and times, such as the Chicago trading pits and Abbeville itself, but I just never connected with the story or the characters. Perhaps because the story was framed in the grandson’s reflections, the details of the grandfather’s life all felt foregone. I perhaps felt a mild curiosity about the unfolding events, but not an emotional investment. The grandfather and most of the other characters are basically good people. There are a couple of hard-hearted folks, including a childhood rival turned lawyer who is set up as the perpetual antagonist of Karl Schumpeter. There were two characters that I found interesting that I wished had more time in the narrative: a red-headed street-smart secretary named Luella and Karl’s rich and calculating Uncle John. The two of them look to be main characters at one point, but end up in the periphery instead. It is a bit of a feel-good novel, with older characters always at the ready with solid advice and understanding for the younger ones. There is inter-generational bonding over fly-fishing. A small town comes together over a crisis. Personally, I would have liked a little more charisma from the characters and a little more daring to the plot, but I wasn’t to get it. I’ll have to do an end-of-the-year test on this one and see if it’s one of those books that grows in appreciation over time or if it’s of the more forgettable variety. 2009. 286 pages. Mass market paperback. Anna is a fairly new werewolf, still recovering from the abuse of her first pack. Charles is the son and enforcer of the head North American werewolf. In the first book of this series, the Alpha and Omega series, Charles and Anna became mates. This series runs parallel to Patricia Briggs’ Mercy Thompson series. In this second book, Charles and Anna head to Seattle. The North American werewolves are about to go public about their existence and as this has worldwide impact, they will be holding an assembly with a delegation of European werewolves. A powerful, belligerent French werewolf threatens the success of the whole assembly. Amid this tension, mercenary vampires attack Anna and others who are with her. Hunting Ground is definitely a stronger book than the first in the series, Cry Wolf. The mystery here takes some good twists and turns. Even when I figured out who some of the ‘bad guys’ were, I didn’t know the motivations or exactly what their part was in the unfolding events. I really liked the relationship of Charles and Anna in this book. In the first, they were still getting to know each other. In Hunting Ground, though they still have stuff to sort out, they operate more as a team. What I most liked is that Charles wasn’t uber-possessive / protective, as sometimes romantic leading characters can be in urban fantasy novels. He certainly reacts strongly when she is threatened but know when she can protect herself, and even better, when she can save him or others. She makes friends among the American and European werewolves. I especially loved the further exploration of Anna’s powers as an Omega wolf. As Anna explains to another werewolf, “An Omega wolf is an Alpha wolf who is extremely zen.” It’s fantastic to see her demonstrate her powers to calm and even command the Alpha werewolves in her vicinity. 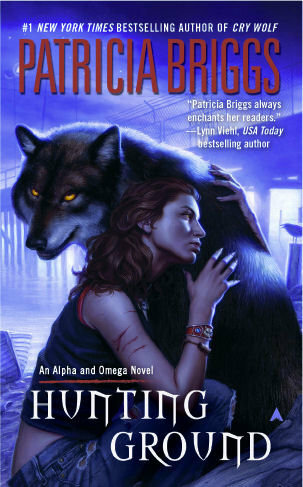 The Alpha and Omega novels delve more into the global and national politics of the werewolves more than the Mercy Thompson series, and I appreciate the different perspective on Briggs’ world. The Mercy Thompson series is still my favorite, mainly because of Mercy herself, but with Hunting Ground, I’m officially on board with the Alpha and Omega series. Although the trees have been dead for some years now, they persevere as structure, architectonic columns, platforms, bridges, and rafts. By virtue of all the lives within and among these trees, even as they gradually go down into the water, they are yet a living forest. Book Blogger Hop, hosted by Crazy for Books, is a cool weekly event that is all about discovering new blogs. I’m trying not to let my Google Reader get overrun, but I do like checking out other book blogs and seeing if there’s some new blogs with which I may have an affinity. So if you haven’t heard of it, check it out!